Special coffee tastings paired with samples of selected treats from Li-Lac Chocolates every Tuesday in February (excluding Feb 10th). Check here for schedule. SPECIAL EVENT: Meet Master Pastry Chef, Jacques Torres in-store on February 10 9am-11am. Buy a slice and receive a free hot chocolate, coffee, or tea. Sample Li-Lac’s famous chocolates every Tuesday (excluding Feb 10th). Enjoy a special coffee pairing at Café Grumpy with your Li-Lac sample every Tuesday in February (excluding Feb 10th). Check here for schedule. With every purchase of Shake Shack’s Crunch-stellation concrete ($4.50 single, $6.75 double), Shake Shack will donate 5% of the proceeds to the local non-profit Fresh Air Fund. Chocolate tastings throughout the month. Receive a 99-cent espresso, small hot latte, or small hot cappuccino with any chocolate bakery item purchase. 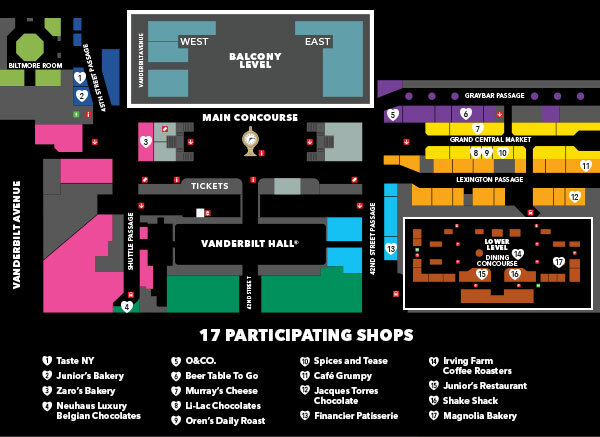 CLICK HERE to download the Grand Central Terminal Chocolate Central map.